No, you’re not in an episode of Vinyl—you're in a secret, new, love-letter-to-the-‘70s kind of bar in Hollywood. But first, you’re in a pizza shop. Opening tonight, Sunset & Vinyl is a hidden, intimate cocktail lounge you can only access through the 800 Degrees pizza restaurant on Vine. It's the latest venture from pizza-chain 800 Degrees’ founder, Anthony Carron, who’s transformed the vacant space above his restaurant into something of a time capsule thanks to vintage velvet furniture, amber lighting and vinyl records tucked away in corners and on full display in a long rack by the door. Just be sure to get there early—this spot only accommodates 35 people. Fortunately, we do. When you enter 800 Degrees, make your way past the leather booths and the pizza station—which is worth a stop if you’re feeling peckish—and head toward the bathrooms. Breeze by them and make a left, then continue up the stairs. It’s here you’ll find a laid-back space designed to feel as comfortable as your own living room. Given the name, vinyl is, of course a theme. 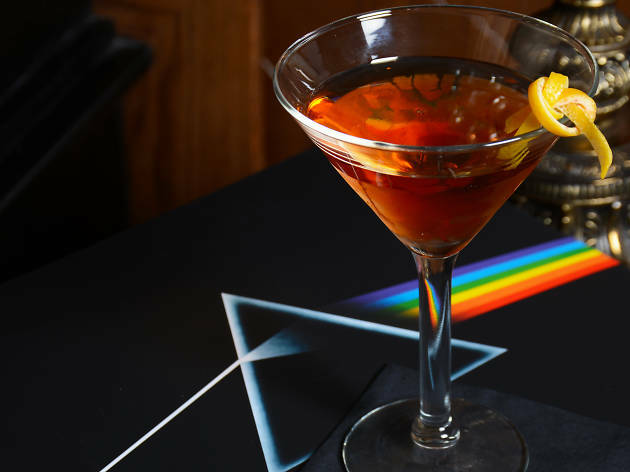 The music you’ll hear will always be played from the groove-y discs, and guests are even encouraged to bring their own collection and give them a spin on the bar's vintage record player. 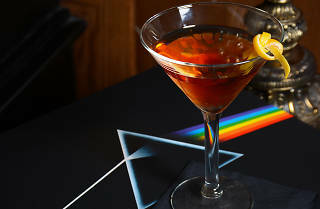 The cocktails here, conceptualized by beverage consultant Devon Espinosa (formerly of Ink and Woodley Proper) and executed by bar manager Brandon McCulloch, are of a bright and genre-bending variety, and designed for sipping along to your favorite albums. Look for the Dance or Die, with mezcal, pineapple and Aperol; the Back Room, with Becherovka, vodka and ginger beer; the Off Sunset, made of tequila blanco, grapefruit, jalapeño and house-made grenadine; and the Bubba’s Way, featuring rye, applejack, green chartreuse and Carpano Antica Formula, among others. If all those cocktails work up an appetite, 800 Degrees serves pizza until 2am downstairs. Check out more photos here, then swing by the bar yourself when it opens tonight at 6pm. Sunset & Vinyl opens tonight at 1521 Vine Street, above 800 Degrees, and serves cocktails from 6pm to 2am, daily.